In 1986, Environ Control was founded by Robert Koide. 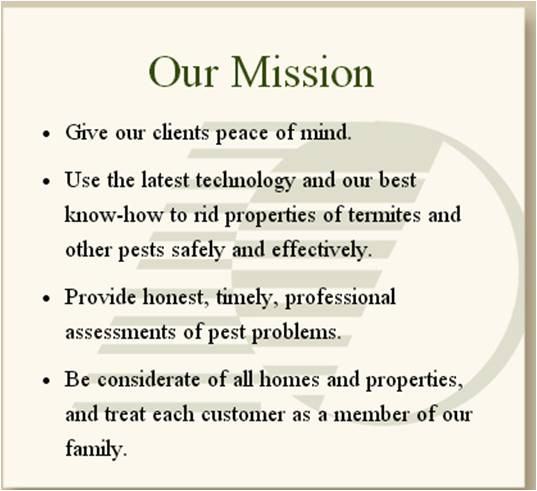 The standard treatment for ground termite control was used. Pumping 150-200 gallons of termiticide around ah ome was the norm. In 1994, Environ Control was one of the 4 Authorized Operators to promote and sell the Sentricon Termite Colony Elimination System. In 1995, Wayne Koide, President - started with Environ Control. In 1996, Stacy Bautista, Vice President - started with Environ Control. In 1997, Sentricon Survey named Environ Control #1 in Hawaii for Professionalism and Excellent Customer Communication. In 2003, Sentricon w/ESP Technology was introduced. In 2004, Environ Control won the Hawaii BBB Torch Award for Business Ethics for personal service, honest estimates, affordable services and high standards. In 2005, Environ Control's 20th Anniversary - Donated $30,000 worth of Sentricon to Momilani Elementary and Kanoelani Elementary Schools. In 2010 - Robert Koide - founder of Environ Control retired. In 2011 - The New Sentricon with Always Active Technology was released. The Next Generation...Here we are! Today, with the transition from Robert to Wayne and Stacy running as smooth as can be. We now look to the future. How can we grow our business? How can we maintain the level of service and integrity that Bob has instilled in us? We work every day to KEEP things running smoothly and to KEEP the high standards in service and integrity...We expect a lot from ourselves & our employees. Just as our customer's expect a lot from us. We're here to work together and strive to meet and exceed our customer's expectations to build a profitabable and growing business.